Over the course of the 1880s and 1890s, the quality of Indian silverwork progressed rapidly. With the basics under their belts, the early smiths began to seek the advice of Hispanic silversmiths or plateros to learn the finer points of the craft. This extra instruction, combined with additional years of experience, also made first generation smiths better teachers to their sons. Most importantly, perhaps, the rise of the trading post system brought more and better jeweler’s tools and supplies to the Reservation.During this time Native silversmiths mastered additional construction and decoration techniques, such as making wire and shaping silver by pounding it into dies, greatly enhancing the variety of their jewelry designs.The most important technical accomplishment, however, was soldering. The ability to join various parts together, rather than making the ornament from a single piece of silver, allowed the construction of more complex and sophisticated jewelry. Even more fortuitously, soldering allowed the early smiths to set stones in silver. 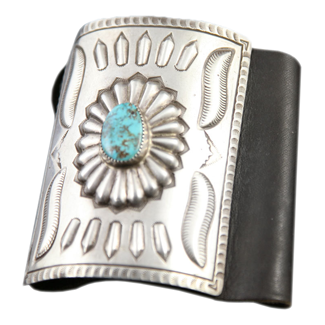 This probably was first accomplished in the late 1870s and marked the true beginning of the Southwestern Indian jewelry tradition as we know it today.